We are indebted for much of our information about the building of the Armstrong Hall in Thornbury to Joan Hall (then Joan Cox) of the hall development committee in 1972. 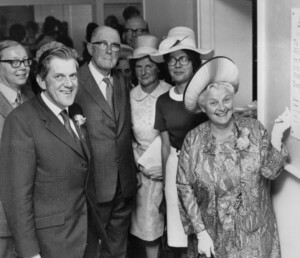 The Hall was opened officially on 8th September 1972 by Frank D. Armstrong JP in whose honour the hall was named. 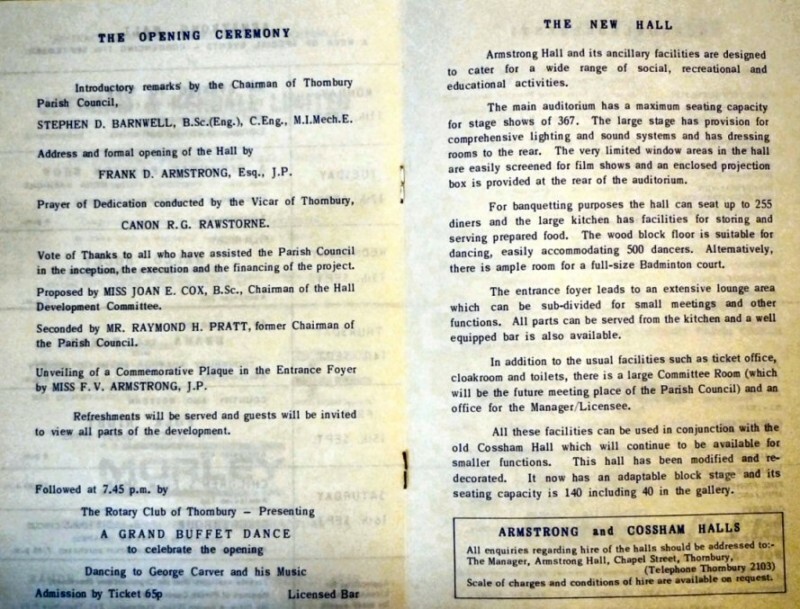 The photograph here on the left is of the official opening ceremony for The Armstrong Hall. It shows from the left Philip Cooper the architect of the building, Mr S Barnwell, chairman of the Parish Council, Frank Armstrong, Mrs Barnwell, Miss Joan Cox (Chairman of the Armstrong Hall Committee) and Miss Armstrong representing the Armstrong Trust. According to an article in The Gazette newspaper it was as early as 1960 that the Parish Council began to consider the possibility of making additions in the Cossham Hall. In 1963 negotiations began with the owners of the property on the corner of Chapel Street and High Street but these fell through. 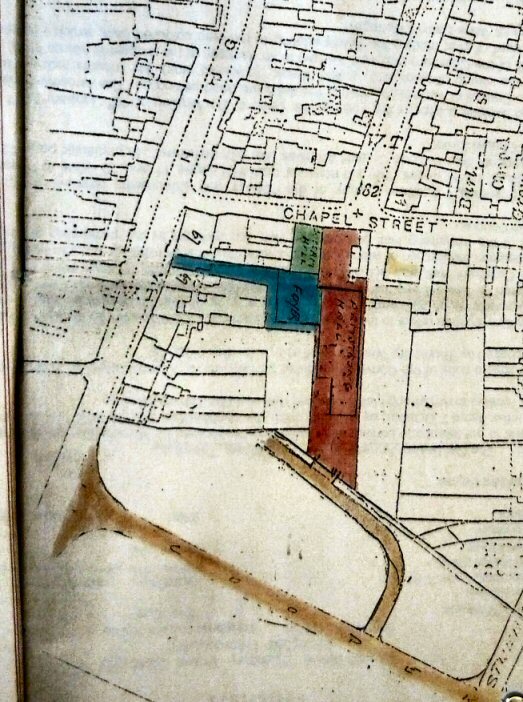 In 1965 a public meeting authorised the Council to raise a loan of up to £4,750 for the purchase of 2 Chapel Street which adjoined the Cossham Hall and which had a large garden going right back to the railway line. A further £5,000 was to be allowed for improvements to the Cossham Hall. The house at 2 Chapel Street was bought in 1965 but had to be rented out while funds were found and planning permission sought to proceed with the project. The plan shown here below on the left (please click on it for a larger photograph) illustrates clearly how much bigger the new Armstrong Hall complex was to be when compared with the only facility then existing, the Cossham Hall. 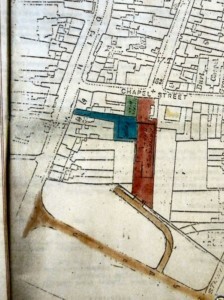 It shows Miss Saise’s cottage in the High Street and the garden behind in blue, the Cossham Hall in green and the land acquired with 2 Chapel Street in chestnut brown. The darker brown areas are the railway line and sidings. In the end the plan did not make use of Miss Saise’s cottage, only the garden immediately behind the Cossham Hall. The type of construction chosen for the site was to ensure that the build time would be as short as possible as Thornbury would be lacking a hall during this period and also so that the costs could be kept as low as possible. The then chairman of Thornbury Parish Council Stephen Barnwell and the finance chairman Peter Birkett led negotiations with the councils, British Rail (for access to the rear of the property) and possible grant providers. A public meeting agreed that the Town Council could back a loan application for £45,000. Much of the work on the inside of the hall was done by volunteers in a community effort. Members of local amateur dramatic and operatic societies led by Keith Sullivan and George Excell designed and installed the stage lighting. The Gazette of July 1st 1972 said that Thornbury Parish Council was going all out to raise £5,000 in 30 days. The article said that if this target could be reached within the time scale, the sum collected was to be doubled by an anonymous donor. The appeal was to furnish the building which was due to be completed that September at a cost of £52,000. The anonymous donor later turned out to be Frank D Armstrong JP who had been a magistrate in Thornbury for 27 years, latterly as chairman of the magistrates. It was decided that the hall was to be named the Armstrong Hall in honour of Frank Armstrong who had announced that he was going to donate £13,000 from a family trust. In September 1972 the Gazette explained that Frank Armstrong was also to pay for the amplifying equipment for the hall. Frank Dillworth Armstrong was a local business man who was born in the Llandudno in July 1900. His parents were Dillworth Armstrong, an accountant in an electrical engineering firm, and his wife, Grace. An obituary in the Times describes him as the founder of the Ribena company. The University of Bristol timeline for its centenary in 2009 says that Ribena was actually invented in 1936 by a Bristol scientist Dr Vernon Charley who was working at the Long Ashton Agriculture and Horticulture Research Station. The blackcurrant drink provided an important alternative source of vitamin C during the war years when oranges were in scarce supply. It was apparently produced for free distribution to children by the Ministry of Food. Frank appears to have been part of the Bristol based company H W Carter that produced the drink. It was taken over by the Beecham Group (later becoming part of GlaxoSmith Kline). We believe that the connection between the Armstrong family and Ribena continued for some time as the Armstrong Agencies website says that “Armstrong Manufacturing Ltd (AML) was formed in 1970 to make Ribena for Beecham (now Glaxo Wellcome).” We know that Frank Armstrong had retired by this point and so this was obviously taken on by other members of the family. The Armstong family founded the Armstrong Trust, grants from which have benefitted for the most part children’s charities mainly in Dorset and the former county of Avon. Frank Armstrong died in July 1993 aged 92. We have an image of part of the programme for the opening here on the right. Please click here to see the website of the present day Armstrong Hall Complex. Today there is a growing campaign to provide a larger more modern arts and community facilities for Thornbury. ACT (Arts and Community in Thornbury) the expressed aim to introduce a contemporary venue for better display of local talent, including a theatre, capable of supporting small and large audiences (up to 500), a cinema, a recording studio, rehearsals, classes, workshops and exhibitions. As far as we know this project was shelved in 2013 when a report suggested that the scheme was not financially viable.